43 year old Krishna Chandra Roy`s passion has always been to make sarinjas and dotaras - the popular musical instruments of the Rajbongshis. Though from a farming family, he possessed an innate skill for carpentry and was an avid learner. He successfully experimented with making a dotara for a village elder while still a pre-teen. He later honed his skills by spending time with Dotara perfomers and observing both their playing and the instrument itself very carefully. Originally from Haldibari in Cooch Behar district, Krishna`s career has been chequered, to say the least: he has been a press compositor, a shuttering mechanic, a dispenser of homeopathic medicine and a private tutor. He currently is a share market agent. When he first came to Siliguri as an eighteen year old, he also worked as an assistant to a carpenter. Krishna has been making his instruments for artists for years; but it is only recently that he has started making them commercially. He also makes the most exquisite miniature replicas of dotaras and sarinjas, exactly to scale. 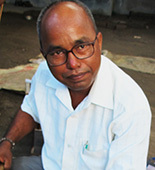 Krishna is probably the only surviving skilled dotara maker in Darjeeling district.